The growth in apartment values in Robina is significantly outpacing the wider Gold Coast as buyers increasingly look to prime inner city living, new research by independent property analyst Urbis shows. The 'Outlook Robina' report reveals apartment values have grown by 7.9 per cent in the last three years in Robina, on the back of increasing sales volumes. This compares to an average of 4.9 per cent across Gold Coast City. Rental vacancy rates in Robina are less than one per cent, even tighter than Gold Coast City's rate of 1.1 per cent, with a vacancy rate of less than 2 per cent indicating an area is facing serious undersupply. Urbis Senior Consultant Lynda Campbell said increasing values in Robina were driven by intense demand, due to not enough apartments being built in the last six years. She said the lack of supply coincided with high interest for rental properties, particularly new apartments. "Demand for Robina is being driven by Gen Y and Baby Boomers, who are attracted to apartment living and a low maintenance lifestyle," she said. "The walkability of Robina makes it a very attractive choice for both age groups, providing connectivity to restaurants, cafes, shops, lifestyle opportunities, employment, education, public transport and the hospital and health precinct. "The report also compares affordability to capital city locations finding Gold Coast apartments are $74,000, $145,000 and $345,000 more affordable than Brisbane, Melbourne and Sydney respectively, and command higher rental yields. Construction of the Robina Group's Bohème Apartments, situated in the $250 million CityVillage community, is in full-swing, with the development attracting buyers looking for a home with both lifestyle benefits and investment potential. 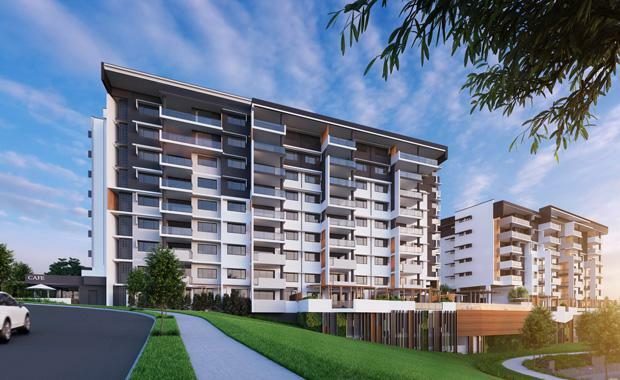 The Robina Group sales manager Azura Griffen said the developer had fast-tracked construction on the second tower at Bohème Apartments to meet high demand, with more than 80 per cent of the project sold totalling $52 million in sales. "Buyers have been waiting for a new apartment project of this calibre and prime location in Robina, which is why we’re seeing such great momentum," she said. "Construction is underway on both towers now and interest is only continuing to build as buyers know they can move into, or rent out, their new apartment soon. "Bohème Apartments will feature a total of 129 apartments across two towers, along with a cafe and resort-style recreation deck with pool and barbeque area. Main image: Robina Group's Bohème Apartments at CityVillage.